The U.S. economy cooled modestly in the fourth quarter of 2018, as February’s release of gross domestic product (GDP) showed the economy grew at an inflation-adjusted annualized pace of 2.6%, compared to a 3.4% third quarter rate and an even stronger 4.2% pace witnessed in the second quarter. Despite moderating growth, an ongoing divergence between domestic and international fundamentals continued to serve as a dominant global macro theme through February, with mounting expectations that central monetary authorities would follow a shallower-than-previously-expected near-term policy path. 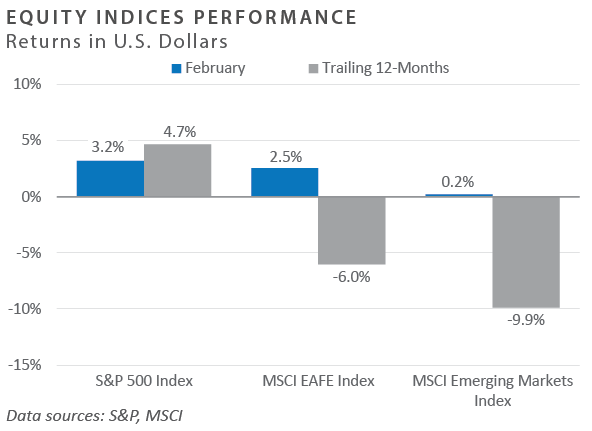 In addition, strong positive momentum across global risk sectors witnessed in January spilled over into February, supporting global equity returns, particularly domestic. 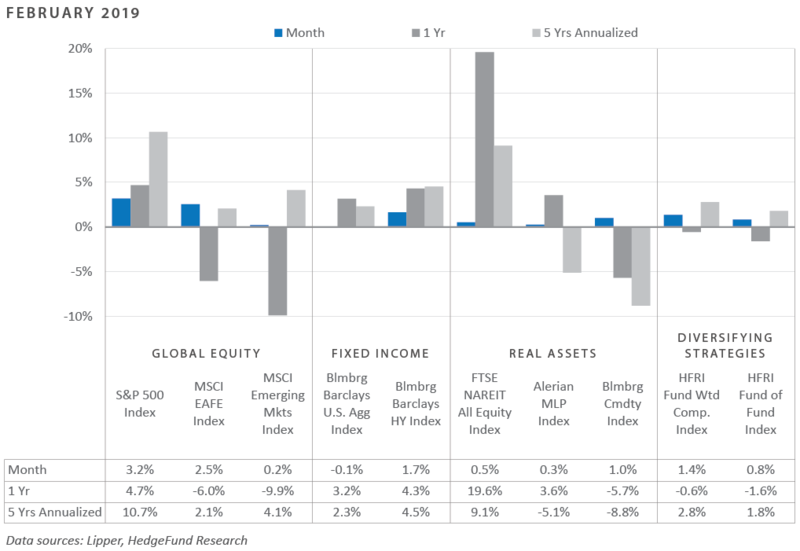 Fixed income markets also participated in the risk-on market environment that has characterized the first two months of 2019, with solid returns generated in credit-related sectors such as high yield and bank loans. Real assets continued to post strong performance during the month, with commodities, energy infrastructure, and REITs each enjoying double-digit year-to-date total returns. The transmission of tax stimulus into the economy and a roll-back of certain regulations helped drive a wedge between domestic and international fundamentals in 2018, with most broad measures of U.S. economic activity pointing to an expansionary bias, as conditions appear to have moderated abroad, particularly in Europe and Japan. Recent updates to late-2018 growth dynamics help highlight this divergence, as U.S. real GDP growth ascended to a three-and-a-half-year high of 3.1%, while euro zone growth slowed to 1.2%, a five-year low, and Japanese growth declined to 0.0%, the weakest pace since first quarter 2015. Since most economic data provides a lagged-view of business cycle conditions, extrapolating this ongoing deviation into a future set of assumptions would undoubtedly serve as an imprudent endeavor. Indeed, estimates of first quarter 2019 GDP, such as the Atlanta Fed’s GDPNow™ model, have evolved to reflect a much shallower growth trajectory, with the model’s most recent update from March 6th indicating a 0.5% growth rate. The latest partial government shutdown, however, may have exerted inorganic weakness into late-2018/early-2019 economic data. The expansion of the federal budget deficit as a means to finance the most recent tax package has the potential to complicate policy makers’ ability to combat future business cycle downturns, since recent deficit growth has outpaced growth in GDP, driving the budget-balance-as-a-percentage-of-GDP ratio deeper into deficit territory. In fact, through year-end 2018, the ratio stood at -4.5%. Absent restrictive near-term fiscal policy and/or a significant growth spurt, the U.S. economy may enter the next downturn with one of the worst fiscal standings in recent memory. Of course, proponents of the growing Modern Monetary Theory movement, which calls on the Federal Reserve (Fed) to utilize its balance sheet as a debt monetization tool to fund expansionary social programs, would likely find little concern with the U.S.’s deteriorating fiscal position. Aside from a potentially destabilizing loss of confidence in the U.S. dollar as a global reserve currency, the allure of expansionary fiscal policy sourced by simultaneous expansionary monetary policy is sure to gather momentum in the coming years. To summarize, the U.S. remains one of the few remaining bright spots amid a weakening global economic backdrop, as U.S. GDP growth has accelerated to a three-and-a-half-year high, while the growth trajectory of many key trading partners has headed in the opposite direction. 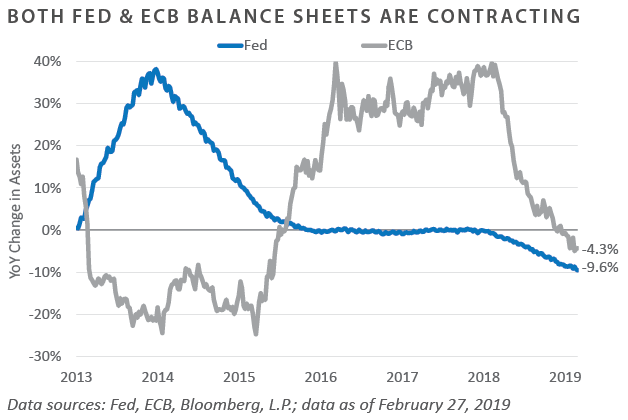 As fiscal stimulus tailwinds begin to fade, the likelihood of this divergence continuing presumably remains limited, forcing policy makers to reach deeper into their toolkits in search of creative ways to keep the economic engine chugging along. 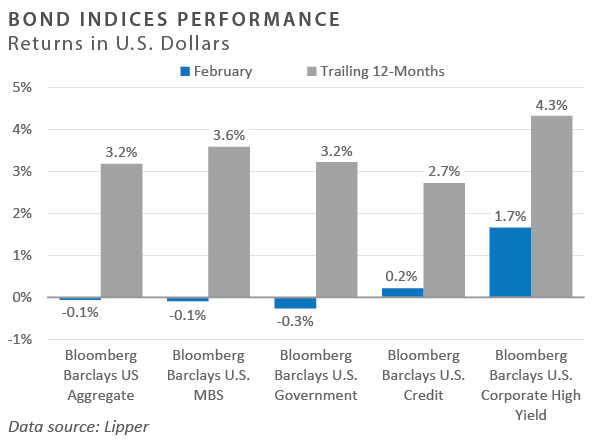 Following a rebound in January, developed equity markets continued to rally in February. The U.S. equity market led global markets with the end of the U.S. government partial shutdown, the continued dovish stance of the Fed, and the progression towards a trade deal between the U.S. and China. Micro cap stocks surged during the month, outperforming both small and large cap stocks. 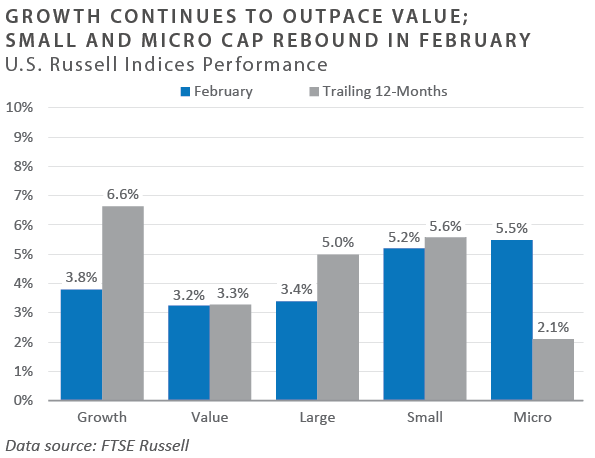 The surge was primarily attributed to standout performers in the Russell Microcap Index, specifically within the financials and health care sectors. Growth continued to outperform value, but the performance disparity reduced. Momentum in Europe continued to weaken with a contraction in manufacturing activity and political changes in Spain and Italy. The sterling appreciated against the dollar, with expectations of the UK and the European Union reaching an agreement as opposed to a “no-deal” Brexit. The rally in emerging markets stalled, as currencies weakened against the dollar. Latin America experienced heightened volatility due to on-going political and economic tensions in Venezuela. While the recent Chinese stimulus package and trade negotiation progression supported Chinese equities, economic data overall remained soft outside the U.S.
High yield bond spreads to Treasuries tightened with the resurgence of risk tolerance, while the performance of higher quality bond sectors was lackluster, suggesting that markets continue to have a constructive outlook on the U.S. economy. In the Fed’s Semiannual Monetary Policy Report to Congress in late February, Fed Chair Jerome Powell reiterated the Fed’s intention to remain patient amid a generally favorable U.S. economic outlook, with conflicting signals—disappointing retail numbers in contrast with steady hiring, wage growth, and low unemployment. Additionally, Powell indicated that the Fed plans to stop shrinking its balance sheet by the end of 2019, thus maintaining a considerably larger balance sheet in the long run, in contrast with pre-2008 levels. Further details regarding the plan to end “quantitative tightening” are expected to be announced in the coming months. As of February 28th, Fed fund futures projected neither a rate hike nor a rate cut in 2019, but did indicate a potential rate cut in 2020. 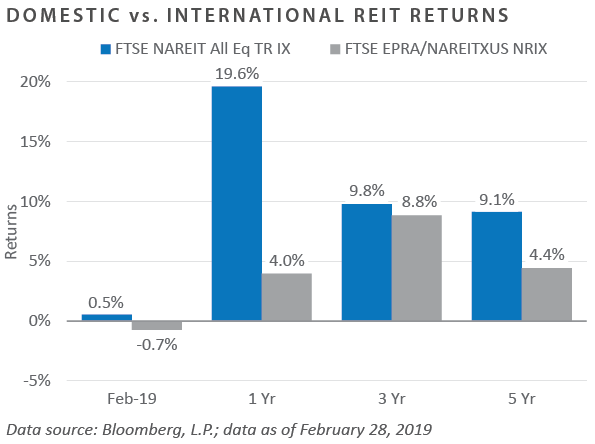 U.S. REITs, as measured by the FTSE NAREIT Equity TR Index, rose marginally by 0.5% in February, lagging the strong gains seen in January (+11.6%). Tepid returns can be partially attributed to a continuation of downward pressure on capitalization rates (cap rates). Cap rates for most property types continue to trend downward through 2019, mainly due to rich property valuations. However, in certain sectors, such as commercial real estate, increases in property prices have been supported by rising net operating income, explaining resilient year-to-date returns. Crude oil (WTI) rose over 6% in February, reaching a high of $57.4/barrel during the month on the positive outlook for OPEC-led supply cuts and the announcement of a higher-than-expected cut by Saudi Arabia. The cuts come alongside involuntary production headwinds resulting from U.S. sanctions on Venezuelan and Iranian crude oil. 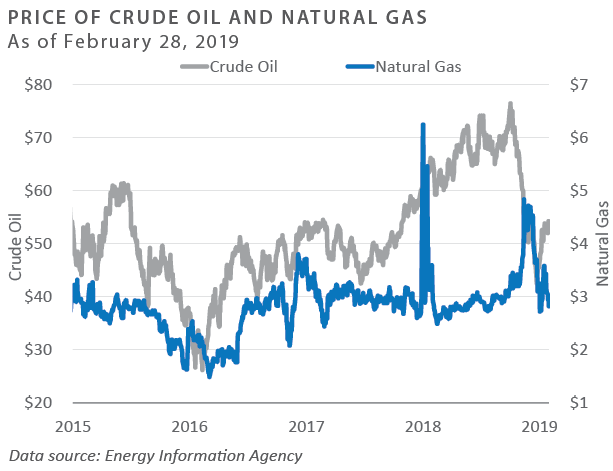 While U.S. oil production is on the rise, risk remains with the outcome of the U.S.-China trade agreement and concerns over a slowdown in global growth. Commodity benchmark returns were led by the performance of energy and industrial metals. Industrial metals’ returns have mainly come from recovering emerging markets and China's Purchasing Managers Index. Despite overall global uncertainty regarding the U.S.-China trade agreement, industrial metals began to recover on the news of historically low PMI levels in China, as the market began to price in potential mean-reversion. Event-driven strategies were generally positive during the month. Average merger arbitrage spreads tightened, more likely due to reduced supply rather than deal-specific catalysts. Distressed investing was broadly supported by high yield spread tightening and a lack of negative idiosyncratic situations, which tend to drive the returns of process-driven investments. Trend-followers experienced mixed results across asset classes. While equity markets continued their strong rebound in February, following a tumultuous fourth quarter, agricultural commodities such as wheat and coffee drew down further in the month, benefitting those managers positioned for weakness. Trends across developed market bonds generally reversed course in February, catching managers off guard. Finally, U.S. dollar price action was choppy throughout the month, resulting in additional losses. 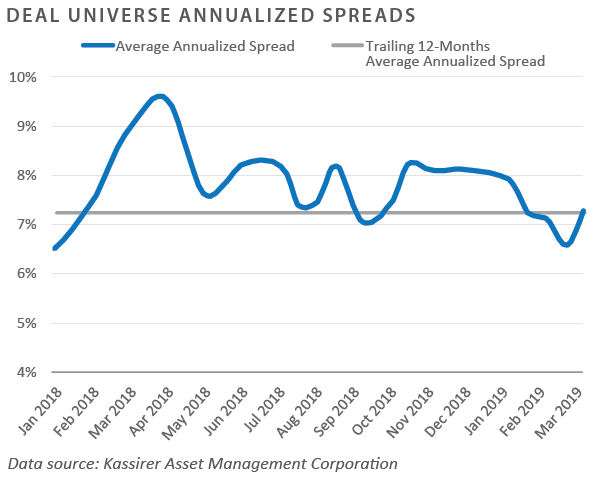 Volatility investors largely benefitted from risk-on positioning, while some profited from relative value arbitrage trades, as prices continued to mean revert in February. Defensive, or long volatility, positions were punished by decreasing implied volatilities across a wide array of global risk assets. This report was prepared by FEG (also known as Fund Evaluation Group, LLC), a federally registered investment adviser under the Investment Advisers Act of 1940, as amended, providing non-discretionary and discretionary investment advice to its clients on an individual basis. Registration as an investment adviser does not imply a certain level of skill or training. The oral and written communications of an adviser provide you with information about which you determine to hire or retain an adviser. Fund Evaluation Group, LLC, Form ADV Part 2A & 2B can be obtained by written request directly to: Fund Evaluation Group, LLC, 201 East Fifth Street, Suite 1600, Cincinnati, OH 45202, Attention: Compliance Department. The information herein was obtained from various sources. FEG does not guarantee the accuracy or completeness of such information provided by third parties. The information in this report is given as of the date indicated and believed to be reliable. FEG assumes no obligation to update this information, or to advise on further developments relating to it. FEG, its affiliates, directors, officers, employees, employee benefit programs and client accounts may have a long position in any securities of issuers discussed in this report. Index performance results do not represent any managed portfolio returns. An investor cannot invest directly in a presented index, as an investment vehicle replicating an index would be required. An index does not charge management fees or brokerage expenses, and no such fees or expenses were deducted from the performance shown. Neither the information nor any opinion expressed in this report constitutes an offer, or an invitation to make an offer, to buy or sell any securities. Any return expectations provided are not intended as, and must not be regarded as, a representation, warranty or predication that the investment will achieve any particular rate of return over any particular time period or that investors will not incur losses. Investments in private funds are speculative, involve a high degree of risk, and are designed for sophisticated investors. All data is as of February 28, 2019 unless otherwise noted. The Alerian MLP Index is a composite of the 50 most prominent energy Master Limited Partnerships that provides investors with an unbiased, comprehensive benchmark for this emerging asset class. Barclays Capital Fixed Income Indices is an index family comprised of the Barclays Capital Aggregate Index, Government/Corporate Bond Index, Mortgage-Backed Securities Index, and Asset-Backed Securities Index, Municipal Index, High-Yield Index, and others designed to represent the broad fixed income markets and sectors within constraints of maturity and minimum outstanding par value. See https://ecommerce.barcap.com/indices/index.dxml for more information. The CBOE Volatility Index (VIX) is an up-to-the-minute market estimate of expected volatility that is calculated by using real-time S&P 500 Index option bid/ask quotes. The Index uses nearby and second nearby options with at least 8 days left to expiration and then weights them to yield a constant, 30-day measure of the expected volatility of the S&P 500 Index. FTSE Real Estate Indices (NAREIT Index and EPRA/NAREIT Index) includes only those companies that meet minimum size, liquidity and free float criteria as set forth by FTSE and is meant as a broad representation of publicly traded real estate securities. Relevant real estate activities are defined as the ownership, disposure, and development of income-producing real estate. See www.ftse.com/Indices for more information. 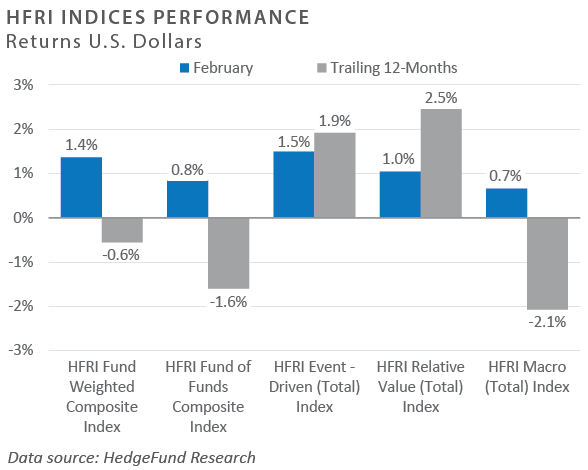 HFRI Monthly Indices (HFRI) are equally weighted performance indexes, compiled by Hedge Fund Research Inc. (HFX), and are used by numerous hedge fund managers as a benchmark for their own hedge funds. The HFRI are broken down into 37 different categories by strategy, including the HFRI Fund Weighted Composite, which accounts for over 2000 funds listed on the internal HFR Database. The HFRI Fund of Funds Composite Index is an equal weighted, net of fee, index composed of approximately 800 fund- of- funds which report to HFR. See www.hedgefundresearch.com for more information on index construction. J.P. Morgan’s Global Index Research group produces proprietary index products that track emerging markets, government debt, and corporate debt asset classes. Some of these indices include the JPMorgan Emerging Market Bond Plus Index, JPMorgan Emerging Market Local Plus Index, JPMorgan Global Bond Non-US Index and JPMorgan Global Bond Non-US Index. See www.jpmorgan.com for more information. Merrill Lynch high yield indices measure the performance of securities that pay interest in cash and have a credit rating of below investment grade. Merrill Lynch uses a composite of Fitch Ratings, Moody’s and Standard and Poor’s credit ratings in selecting bonds for these indices. These ratings measure the risk that the bond issuer will fail to pay interest or to repay principal in full. See www.ml.com for more information. Morgan Stanley Capital International – MSCI is a series of indices constructed by Morgan Stanley to help institutional investors benchmark their returns. There are a wide range of indices created by Morgan Stanley covering a multitude of developed and emerging economies and economic sectors. See www.morganstanley.com for more information. The FTSE Nareit All Equity REITs Index is a free-float adjusted, market capitalization-weighted index of U.S. equity REITs. Russell Investments rank U.S. common stocks from largest to smallest market capitalization at each annual reconstitution period (May 31). The primary Russell Indices are defined as follows: 1) the top 3,000 stocks become the Russell 3000 Index, 2) the largest 1,000 stocks become the Russell 1000 Index, 3) the smallest 800 stocks in the Russell 1000 Index become the Russell Midcap index, 4) the next 2,000 stocks become the Russell 2000 Index, 5) the smallest 1,000 in the Russell 2000 Index plus the next smallest 1,000 comprise the Russell Microcap Index, and 6) US Equity REITS comprise the FTSE Nareit All Equity REIT Index. See www.russell.com for more information. S&P 500 Index consists of 500 stocks chosen for market size, liquidity and industry group representation, among other factors by the S&P Index Committee, which is a team of analysts and economists at Standard and Poor’s. The S&P 500 is a market-value weighted index, which means each stock’s weight in the index is proportionate to its market value and is designed to be a leading indicator of U.S. equities, and meant to reflect the risk/return characteristics of the large cap universe. See www.standardandpoors.com for more information. Information on any indices mentioned can be obtained either through your consultant or by written request to information@feg.com.